For a more general discussion of the physics of cheating in baseball, read this recently published paper: A.M. Nathan, L.V. Smith, W.L. Faber, and D.A. Russell, "Corked bat, juiced balls, and humidors: The physics of cheating in baseball," Am. J. Phys., (79) 6, 575-580 (2011). 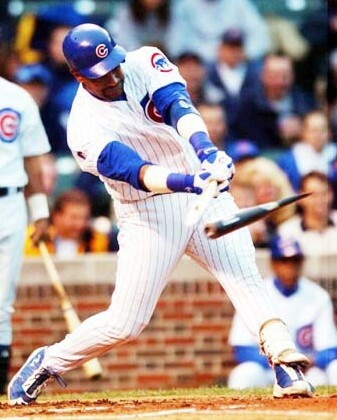 On June 3, 2003, Chicago Cubs centerfielder Sammy Sosa was ejected from a game in the first inning for using a corked bat. His bat shattered upon impact with the ball and the umpire who picked it up discovered the bat had been hollowed out and filled with cork. Sammy said it was an accident - that he had used the bat during batting practice and accidentally grabbed it by mistake when he went to the plate. Regardless of how the bat got there, it was not the first time a player has been caught with a doctored bat, and it won't be the last. But is does raise the question "Why would a player use a corked bat?" Is there any advantage (backed up by science) to using a corked bat? The following arguments were extracted from a reading of Robert Adair's book The Physics of Baseball or from an excerpt from an inverview he gave a few years ago, in which he addressed the issue of corked bats. A corked bat has (slightly) less mass. By drilling out the center of a wood bat and replacing it with cork a player can shave about 1.5 ounces off of the weight of his bat. More importantly, the location of the center-of-mass of the bat would shift slightly towards the handle end of the bat. This means that the moment of inertia of the bat would decrease and it would be easier to swing. Less mass (lower inertia) means faster swing speed. A bat which has less mass, and especially which has a lower moment of inertia, may be swung faster. 1.5oz may not do much for an amateur player, but for a professional it means being able to watch the ball travel an additional 5-6 feet before having to commit to a swing. Plus, research has shown that faster bat swing speed results in faster batted-ball speed, though the change in ball speed would be minimal for most players. The moment of inertia could also be effectively lowered by choking up on the bat, by using a shorter bat, or by shaving some wood off of the handle, all of which are legal methods of reducing bat mass. Less mass means a less effective collision. Lowering the mass (and moment-of-inertia) may increase the bat swing speed, but the lower mass means that the collision between bat and ball is less effective. If the swing speed is kept constant, a heavier bat will always propel the ball faster and farther. So removing mass from the bat will actually reduce the batted-ball speed. No scientific advantage? Reducing the mass (lowering the moment-of-inertia) increases the swing speed - which increases batted-ball speed. But at the same time the lower mass reduces the effectiveness of the collision - which decreases the batted-ball speed. Which effect is greater is a toss-up. But since the two effects offset eachother, there appears to be absolutely no scientific advantage to using a corked bat - at least for hitting home runs. There would be an advantage to just making contact, however. Because the bat is lighter and can be swung faster, a player can wait a few milleseconds longer before commiting to a swing. This means he can watch the pitched ball travel about 5 or 6 more feet before deciding to swing. For a slumping player this may help make contact with the ball more often. But, a corked bat will not make the ball go faster or further. Psychological Advantage? I read a quote by a major league player in one of newspaper reports covering the Sammy Sosa incident that went something like: "I don't care what all those MIT professors say, if players didn't think it made a difference, why have they been doing it for all these hundreds of years?" Baseball is a very superstitious sport - look at all of the rituals batters and pitchers go through before and during a game. Some players have lucky socks, shirts, hats which they refuse to wash for fear it might ruin their current streak. Other players have a set ritual before each game or each at-bat. The key factor to the corked bat would seem to be that if a player thinks it will make a difference in his game, then it very likely might make a difference. The effect is psychological, not a result of increased performance from the bat itself. Detroit Tigers' Norm Cash admitted to using a corked bat in 1961 when he won the batting title with a .361 average, but the next year he slumped to .243 with the same corked bat. Why use cork? Well, the hollowed out portion of the bat needs to be filled with something or the bat would sound significantly different than a solid bat, giving away the illegal modification. Graig Nettles was playing for the New York Yankees in 1974 when he broke a bat during a game and six superballs bounced out. I read somewhere that several Anaheim Angels players had experimented with liquid mercury - which would be very interesting because the moment of inertia would change while the bat is being swung, with the largest inertia just before impact. How do you Cork a Bat? Corking a bat the traditional way is a relatively easy thing to do. You just drill a hole in the end of the bat, about 1-inch in diameter, and about 10-inches deep. You fill the hole with cork, superballs, or styrofoam - if you leave the hole empty the bat sounds quite different, enough to give you away. Then you glue a wooden plug, like a 1-inch dowel, in to the end. Finally you sand the end to cover the evidence. Some soures suggest smearing a bit of glue on the end of the bat and sprinkling sawdust over it so help camouflage the work you have done. Sammy's corked bat was different. 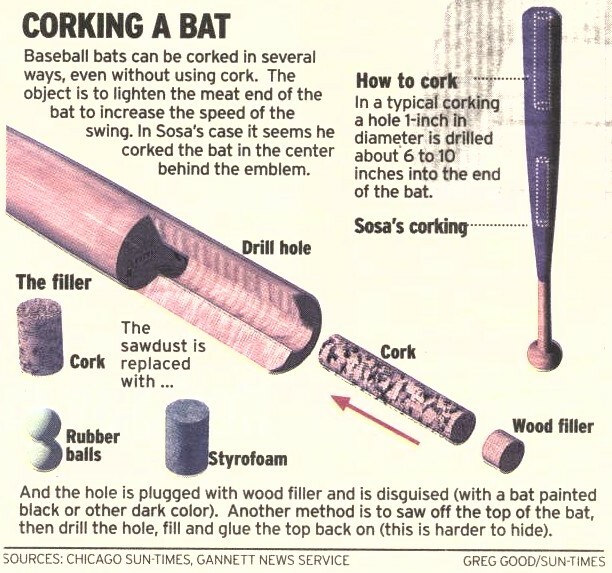 What makes Sammy Sosa's corked bat interesting is that it was not corked in the usual way, by drilling a hole in the end of the barrel. The cork-filled hole in Sammy's bat was in the taper region at the middle of the bat. This would have a different effect than has been described above. Instead of lowering the moment of inertia by removing mass from the end of the bat, Sosa's corked bat would probably have had a very similar moment of inertia (perhaps even a little higher) than an uncorked bat of exactly the same dimensions. If the taper region was weakened then the bat might be more likely to flex during the swing, a feature which is currently being designed into some of the newest aluminum and composite baseball and softball bats. If the bat flexes during the swing, and if a player can time the swing just right, then the tip of the bat is moving faster than a rigid bat would be when it meets the ball. For a wood bat, the bat speed just prior to the collision is the single most important factor in how fast the ball comes off the bat. So, it is conceivable that Sosa's specially corked bat could give him a slight advantage for hitting the ball faster and farther. Sammy consistently claimed that he used this corked bat occasionally in batting practice to put on a homerun show for the fans. However, as he found out to his embarrassment, using such a bat in a game situation is not a good idea. In batting practice the hitter is hitting balls which are pitched so that he can hit them, in order to help him warm up his swing mechanics. In a game when the opposing pitcher is purposefully trying to jam the batter with a pitch to the inside, a bat which has been weakened at the taper/handle region will break very easily. Fig. 1 Graphic published in the Chicago Sun Times, June 4, 2003. A couple of years ago Fallon and Sherwood at the UMass-Lowell Baseball Research Center did some experiments with aluminum bats and corked wood bats. They used the Baum Hitting Machine to swing a bat at approximately 66 mph towards a ball moving at 70 mph. After normalizing for inertia properties of the bats they found that corked bats produced batted-ball speeds about 0.9 mph higher than normal wood bats. They also found that their corked bats cracked after as few as 3 impacts, so the data they were able to collect was limited before the bats were damaged. However, their results appear to contradict the basic physics arguments given above. An unpublished experiment carried out by Alan Nathan using the same equipment at the UMass-Lowell Baseball Research Center found a very different result. This experiment took two identical wood bats (same length, mass, MOI, etc.) and drilled a 7/8" diameter 9-1/4" deep hole in one of them. 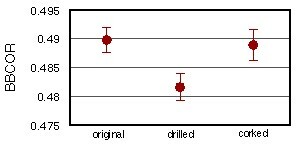 He measured the bat-ball coefficient-of-restitution (BBCOR, defined below) of the bat-ball collision and found that the results were identical for the normal and corked bats. Using this information and data on how the swing speed depends on the bat's inertia properties from the Crisco-Greenwald batting cage study Dr. Nathan predicted that the final batted ball speed would actually be lower for the corked bat than it would be for the normal bat. In July of 2003, I had the opportunity, with Alan Nathan (Univ. of Illinois) and Lloyd Smith (Washington State Univ. ), to measure the Bat-Ball Coefficient-of-Restitution (BBCOR) of several corked and normal wood bats. We obtained three professional grade wood bats (33") from Rawlings and measured the BBCOR for all three. We drilled a 1" diameter, 10" deep hole in the end of two of them, and measured the BBCOR of the drilled (but empty) bats. Finally we filled the bats with cork and remeasured the BBCOR. The Bat-Ball Coefficient-of-Restitution (BBCOR) depends primarily on the elastic properties of the ball and bat, with a slight dependence on the moment of inertia of the bat. If a hollowed-out, corked wood bat has a trampoline effect, then it would show up as an increase in the BBCOR. In our experiment, the BBCOR was measured by firing a ball (upwards of 110 mph) from a cannon towards a stationary bat and measuring the speed of the ball before and after it hit the bat. The bat was gripped at the handle by a clamp device which was free to rotate about a pivot, though the bat was initially at rest. For those concerned that clamping the bat in a pivot is not the same as a player holding or swinging the bat, Keith Keonig (Univ. Mississippi) has convincingly shown that batted ball speed is completely independent of the method by which the ball is gripped at the handle. The data at right shows a typical result for one of the bats. 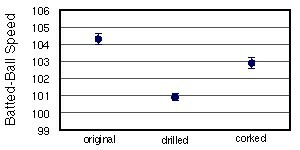 The plot indicates that the BBCOR is lowest for the drilled (hollow) bat. The BBCOR value for the corked bat is slightly lower than the original bat, though given the error in the measurements the results are basically indistinguishable. This result confirms the previous experiment by Alan Nathan that a corked bat does not have a trampoline effect. Fig. 2. BBCOR values measured for a normal wood bat and for the same bat after being drilled and corked. where vball is the incoming ball speed, vbat is the bat swing speed just before collision and eA is the collision efficiency (ratio of ball rebound speed to incoming speed). The bat swing speed depends on the moment-of-inertia of the bat. Using the measurements of eA along with the bat kinematic factor k and knowledge of how swing speed is related to bat moment-of-inertia we obtained the BBS values shown in Fig. 3 at the right. This result suggests that corked bat would produce batted-ball speeds about 1 mph lower than a normal wood bat. Fig. 3. Batted-Ball Speeds predicted for a normal wood bat and for the same bat after being drilled and corked. One of my meager contributions to the understanding of how a baseball bat works is a correlation between the frequency of vibrations in the barrel of a hollow aluminum or composite bat and its measured performance. A lower frequency of the fundamental hoop mode of the barrel means a softer spring constant of the bat, and a greater trampoline effect resulting in higher batted ball speed. A simple mass-spring model of the trampoline effect yields a very interesting result, indicated by the solid black curve in the figure at right. As the frequency of the hoop mode decreases, the performance of the bat increases until an optimal frequency is reached. Below this optimum frequency the performance quickly falls off. The success of this simple model is evidenced by the general characteristics of baseball bats. The majority of aluminum bats currently on the market have hoop frequencies in the neighborhood of 2000 Hz. The highest performing bat I have seen so far has a hoop frequency of about 1600 Hz. A prototype all-composite baseball bat I had the chance to test in my lab was found to have a hoop frequency of about 1450 Hz. This bat was field tested by a top college baseball team and almost every player on the team was hitting balls in excess of 500 ft. In constrast, a 1989 graphite bat - which was marketed as having the strength of aluminum and the perfromance of wood - has a hoop frequency of 3350 Hz. It did not last long on the market because it was a very poor performing bat, nowhere near the performance of available metal bats. When I measured the hoop frequency of the corked wood bats used in our 2003 study I found the hoop frequency to be in excess of 5300 Hz, which essentially means that any enhancement in performance would be almost negligible. Fig. 4. Mass-spring model of the trampoline effect showing how hoop frequency predicts performance. The one experiment that has not been carried out to date (at least to my knowledge) is a carefully conducted field test. This would involve real players swinging at pitched balls, with careful measurements (requiring multiple high-speed video cameras) of pitched ball speeds, bat swing speeds, hit ball speeds, impact locations, bat moment-of-inertia, and vibrational frequency data. If I can find time (and equipment) to conduct this kind of field study I'll be sure to post the results here. ESPN Baseball Tonight, on June 3, 2003 aired a nice segment in which Buck Showalter showed how to cork a bat, drilling the hole, filling it with cork, and plugging the end. R.M. Greenwald R.M., L.H. Penna , and J.J. Crisco,"Differences in Batted Ball Speed with Wood and Aluminum Baseball Bats: A Batting Cage Study," J. Appl. Biomech., 17, 241-252 (2001). As long as the relative speed between bat and ball is kept constant, a simple frame-of-reference arguement can be used to show that identical measurements will be obtained for (i) a moving ball hitting a stationary bat, (ii) a moving bat hitting a stationary ball, and (iii) a moving bat hitting a moving ball. K. Keonig, J.S. Dillard, D.K. Nance, D.B. Shafer,"The effects of support conditions on baseball bat performance testing," Engineering of Sport 5 Vol. 2, pp. 87-93 (International Sports Engineering Association, 2004). Proceedings of the 5th International Conference on the Engineering of Sport, UC Davis, September 11-15, 2004. A.M. Nathan, D.A. Russell, and L.V. Smith, "The Physics of the Trampoline Effect in Baseball and Softball Bats," Engineering of Sport 5 Vol. 2, pp. 38-44 (International Sports Engineering Association, 2004). Proceedings of the 5th International Conference on the Engineering of Sport, UC Davis, September 11-15, 2004. D.A. Russell,"Hoop frequency as a predictor of performance for softball bats," Engineering of Sport 5 Vol. 2, pp. 641-647 (International Sports Engineering Association, 2004). Proceedings of the 5th International Conference on the Engineering of Sport, UC Davis, September 11-15, 2004.